I admit, before seeing the movie I really didn’t see a good reason why a reboot of Hellboy was called for. Kind of like with the ‘Amazing Spider-Man’ movies. 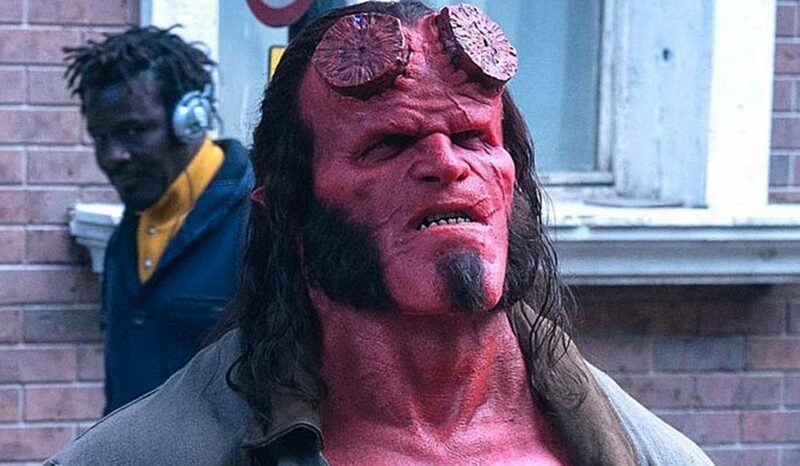 Unfortunately, unlike the Amazing Spider-Man reboot which was at least entertaining (though unnecessary), there just wasn’t much to like with the new Hellboy. The movie seemed to rely too much on blood and gore effects and profanity because… well… ok, I guess just because. And the screenwriter and/or director seems to get a weird thrill out of eyeballs being messily destroyed or showing gaping eye-sockets, because there’s a lot of that. So much that you wonder what these people have against eyes. Now that could be forgiven if the story was interesting. Unfortunately, the story and the screenwriting was weak. The villain wasn’t very scary OR interesting, it was hard to feel much for any of the main characters, and with a handful of exceptions the lines the characters and villains had were either mediocre or simply SUCKED. 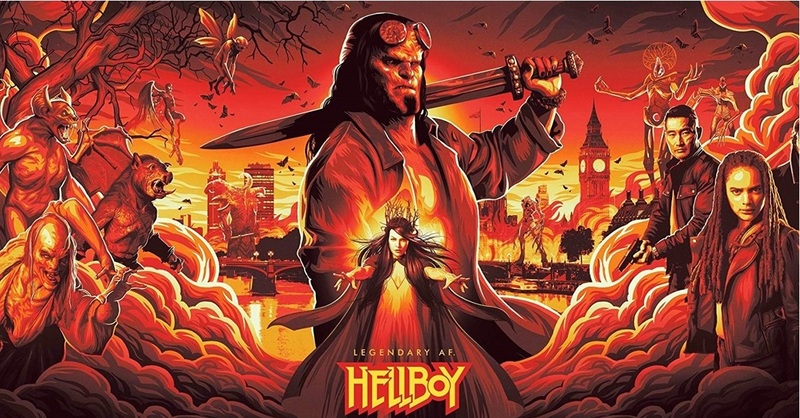 David Harbour as Hellboy was entertaining at times but it felt like a lot was missing, and I feel most of that was due to the questionable script. The sad thing is you know some of the main actors are solid performers from their previous work (as one only recently exposed to Stranger Things, I strongly feel that Harbour was wasted on this film). But I guess one can only do so much with bad writing. I suspect it was only through the efforts of some of the actors that the movie turned out to be remotely watchable AT ALL. To sum up, it just felt like a movie written for 13-year-old boys who want a comic book movie with a lot of gore and profanity. Nothing wrong with those things in and of themselves, but without a decent story or script all it amounts to is half-interesting eye-candy. And while I’m only mildly familiar with the original comics, I’m pretty sure devout fans of the comics might burst a blood vessel out of indignant outrage when they see it. So if you have no expectations and have NOTHING better to do (or like me just needed any excuse to get out of the house), feel free to catch a showing at your local 2-buck discount theater. Otherwise, just go see something else. Rating: Better than being at work… barely. I am pleased to announce that starting in mid-April, Nerd By Northwest will be featuring not one but TWO comics every week! For now, it looks like I will be doing one comic on Wednesday and one on Friday (mostly NBNW comics, but with a few XCOM-ic comic strips interspersed here and there). I won’t lie… these comics do take some time to produce so it’s going to be a significant time drain for me. But I enjoy doing this and more frequent comics are what the readers are demanding, so I’m going to find a way to make this work! Also, I am planning to feature various kinds of additional content each Monday as well. It might be a meme I’ve made, a travel post, a gaming or movie review, or maybe just an outright rant on a random topic. I’ll give that a try for a while, and if you people like it then say so in the comments or contact page and I’ll keep doing it. So the gist of the Reuters article is that they plan to increase fees for the merchant banks for processing transactions. Now while it doesn’t sound like they’re increasing fees on the businesses who take credit cards directly, it is almost certain that the merchant banks will pass on the fees charge to them down to those businesses. Who in turn, are very likely to do 1) pass on the fees to customers by raising prices, 2) offering more ‘cash discounts’ for cash or debit transactions, 3) take a more serious look at “that crazy bitcoin idea the kids are talking about”. Possibly all three. Now the point of my article is not to paint the credit card companies as evil or “the enemy”, but rather show how they are ultimately acting against their own self-interest and potentially pushing more merchants and businesses to accepting crypto as payment. While I do view debt and credit cards as, to paraphrase an old quote, “a dangerous servant and fearful master”, credit cards and bank lending are perfectly valid services and very useful when used properly. But to raise fees at a time when consumers’ debt loads are already high and alternatives to their very business model are beginning to emerge strikes me as being profoundly oblivious. One could argue that mainstream crypto alternatives to credit cards don’t exist and so the credit cards can pull this off profitably, but the crypto and blockchain spaces are still moving quickly despite the slump in prices and mainstream interest. Visa and Mastercard might get to enjoy the additional profits of their higher fees for a couple years, but they would be sowing the seeds of discontent amongst businesses and consumers. Probably merchant banks too… sure the merchant banks and credit card companies have a long history together, but how long will they ignore a viable, lower-cost alternative that would realize higher profits for their company and shareholders? Those planted seeds of discontent would be ready to grow and bear fruit once mainstream-accepted crypto-based alternatives are present in the market, leading to a substantial, if not crippling, loss of market share for Visa and Mastercard. And if a US recession is truly waiting in the wings over the next year or two (which seems likely given the length of this bull run), that will create an even larger incentive for businesses to cut costs. If they were more forward-thinking and open to change, they would be finding ways to adapt their business model to crypto-based alternatives instead of doubling down on their existing system. I suppose it’s always possible they are researching a “crypto plan B” while trying to milk everything from the existing system while they can, but I doubt that’s the case. More often than not it’s the big businesses like this that are REACTIVE as opposed to PROACTIVE and are least open to change… that’s just the nature of bureaucracy and very large systems. Personally this kind of thing makes me hopeful in the long term. The more mistakes that these behemoth companies make, the more opportunities will present themselves for competing businesses and business models. I can’t judge exactly what amount of centralization and decentralization is ideal, but it’s obvious to see that the credit and banking sectors are way too centralized now. Let’s see some more competition emerge, not only providing customers better options but also reducing the systemic fragility in our financial systems by not having so many “Too Big To Fail” institutions out there. Full disclosure: The author owns modest positions in several cryptocurrencies as well as a small crypto-mining operation. Also the author is not a financial advisor, and what is written is solely his opinion and nothing in the article should be taken as professional financial advice. Welcome to the new version of NerdByNorthwest.com! I’ve completed the site’s long-postponed transition to WordPress, which is going to enable a lot more functionality than the old website designer I previously used with my hosting provider. I will continue to update and tweak the site regularly over the next several weeks to streamline the site and add new functionality, but this is more or less the new look going forward. Yeah I should have migrated sooner, but time is finite and I had an existing contract I’d already paid for. You can use the Navigation Toolbar below the logo and main menu bar to navigate through the comics (the most recent will always be displayed on the home page). Or you can also use the drop-down selector in the right sidebar titled “Comic List” to jump directly to a specific comic. Both ‘Nerd By Northwest’ and ‘XCOM-ic’ webcomics are assigned different “chapters” (titled ‘Nerd By Northwest’ and ‘XCOM-ic’, respectively) and are archived accordingly. You can access the separate comics in either the main menu bar (“NBNW Comic Archive” and “XCOM-ic Archive”) or from the drop-down selector titled “Select Chapter” in the navigation bar. Blog posts, movie reviews, travel posts, and most other non-webcomic content is shown in the blog section below the featured comic on the main page. The sidebar will also display the most recent posts, and all posts will be assigned a category (“Travel Posts” for example) to help find specific content. Thanks go out to: 1) “Frumph” whom provided the extremely helpful ComicPress theme and ComicEasel Plugin that I’m using, 2) Nicole Sauce of Living Free in Tennessee who provided initial advice on WordPress options, and 3) all my regular readers who keep me interested in this crazy endeavor! Cartoonist on vacation; new comics resume on January 4th! Jump ToNerd By Northwest #1 - "True Grit"Nerd By Northwest #2 - "Change Bad, Minis Good"Nerd By Northwest #3 - "Fae-urry"Nerd By Northwest #4 - "Hustlin'"XCOM-ic #1 - "The Awakening"XCOM-ic #2 - "Homecoming"Nerd By Northwest #5 - "Sharp Dressed Man"XCOM-ic #3 - "Bring Out the Gimp"XCOM-ic #4 - "Reunion"Nerd By Northwest #6 - "House Rules"XCOM-ic #5 - "Whose Problem? "XCOM-ic #6 - "Head Games"Nerd By Northwest #7 - "World of Withdrawal"Nerd By Northwest #8 - "Player vs. Keyboard"Nerd By Northwest #9 - "Reasons to Encrypt Your Picture Albums"XCOM-ic #7 - "Taco Tuesday! "Nerd By Northwest #10 - "The Clueless Shall Inherit the Earth"Nerd By Northwest #11 - "Living Large"Nerd By Northwest #12 - "The 'YARDIS'"XCOM-ic #8 - "For Science! "XCOM-ic #9 - "What's in a Name? "Nerd By Northwest #13 - "Deep Thoughts"Nerd By Northwest #14 - "A Nerd and His Money Are Soon Parted"Nerd By Northwest #15 - "Fame and Fortune"Nerd By Northwest #16 - "Media Relations"XCOM-ic #10 - "FNG"XCOM-ic #11 - "Damsel in Distress"Nerd By Northwest #17 - "Ladies' Man"Nerd By Northwest #18 - "Father Knows Best"Nerd By Northwest #19 - "Albedo"Nerd By Northwest #20 - "Like Father, Like Son"XCOM-ic #12 - "Dirty Thoughts"Nerd By Northwest #21 - "Payback"Nerd By Northwest #22 - "Morlocks"Nerd By Northwest #23 - "The First Taste is Free"Nerd By Northwest #24 - "The First Step is Admitting You Have A Problem"Nerd By Northwest #25 - "Happy Halloween 2017"XCOM-ic #13 - "Bad Taste"Nerd By Northwest #26 - "Alpha Chef"Nerd By Northwest #27 - "Better With Bacon"Nerd By Northwest #28 - "Aftermath"XCOM-ic #14 - "No Time For Breakfast"XCOM-ic #15 - "Ri-Skee Strategy"Nerd By Northwest #29 - "Dating for Gamers"XCOM-ic #16 - "Bronco Bustin'"Nerd By Northwest #30 - "Safe Place"Nerd By Northwest #31 - "Players Gonna Play"Nerd By Northwest #32 - "Lacking Incentive"XCOM-ic #17 - "My Mama Always Said..."Nerd By Northwest #33 - "Frozen on the Throne"Nerd By Northwest #34 - "Half-Life By Northwest"Nerd By Northwest #35 - "Crowbar - 1, Headcrab Zombie - 0"Nerd By Northwest #36 - "Worst Valentine's Day EVER..."Nerd By Northwest #37 - "Secret Weapon"Nerd By Northwest #38 - "Chemical Warfare"Nerd By Northwest #39 - "We're Going To Need Bigger Beer Goggles..."Nerd By Northwest #40 - "The Final Battle"Nerd By Northwest #41 - "Denouement"Nerd By Northwest #42 - "Orange Obsession"Nerd By Northwest #43 - "Eye Bleach Needed"XCOM-ic #18 - "Psi-Corgi - The Origin Story"XCOM-ic #19 - "With Great Power Comes Great... Burritos? "XCOM-ic #20 - "The Dogface Soldier"Nerd By Northwest #44 - "Privilege"Nerd By Northwest #45 - "Modern Free Speech Zone"Nerd By Northwest #46 - "Double-Edged Sword"Nerd By Northwest #47 - "Thy Eyes Betray Thee..."Nerd By Northwest #48 - "Missing the Point"Nerd By Northwest #49 - "So Close..."Nerd By Northwest #50 - "Body Image"Nerd By Northwest #51 - "Bottomless Pit"Nerd By Northwest #52 - "Donut Illuminati"Nerd By Northwest #53 - "Summit"Nerd By Northwest #54 - "Gift for the Fishies"Nerd By Northwest #55 - "Pearls Before Swine"Nerd By Northwest #56 - "Smells Like Karma"Nerd By Northwest #57 - "Nerd of the Rings"Nerd By Northwest #58 - "One Ringtone to Rule Them All"Nerd By Northwest #59 - "Why You Get Seated Out on the Patio..."XCOM-ic #21 - "Rank Has Its Privileges"XCOM-ic #22 - "Is that Dueling Banjos I Hear? "XCOM-ic #23 - "Alpha Psychic"Nerd By Northwest #60 - "Poker Night"Nerd By Northwest #61 - "Don't Search THIS One At Work..."Nerd By Northwest #62 - "Sometimes The Only Winning Move Is Not To Play"Nerd By Northwest #63 - "Vote Homebrew in 2018"Nerd By Northwest #64 - "The Ugly Truth"Nerd By Northwest #65 - "Happy Halloween 2018! "Nerd By Northwest #66 - "Election Day"Nerd By Northwest #67 - "Everyone has their Price"Nerd By Northwest #68 - "The Blocker"Nerd By Northwest #69 - "No-Shave November"Nerd By Northwest #70: "A Common Enemy Makes For Strange Bedfellows"Nerd By Northwest #71 - "Non-Human Resources"Nerd By Northwest #72 - "Show Me Your Résumés! "Nerd By Northwest #73 - "Fool Me Twice, Shame on Me..."Nerd By Northwest #74 - "Office Christmas Party"Nerd By Northwest #75 - "Higher Love"Nerd By Northwest #76 - "A Serious Commitment"Nerd By Northwest #77 - "Wardrobe Malfunction"Nerd By Northwest #78 - "Penalty to Initiative"Nerd By Northwest #79 - "Let's Make a Deal"Nerd By Northwest #80 - "Unholy Pact"Nerd By Northwest #81 - "Sweet Revenge"Nerd By Northwest #82 - "Mark of the Beast"Nerd By Northwest #83 - "Lowering the Bar"Nerd By Northwest #84 - "Office Space Invader"Nerd By Northwest #85 - "What's in a Title? "Nerd By Northwest #86 - "Wasted Potential"Nerd By Northwest #87 - "Commiseration"Nerd By Northwest #88 - "The Taxman Cometh"Nerd By Northwest #89 - "Real Druids Don't Play"